Karate Grappling: Did It Really Exist? In this article I'd like to ask if karate really does contain any grappling? This is a potentially controversial subject as I found out when I wrote my book on the subject in the year 2000. The passing of the years has done little to diminish that controversy. Certainly there is a now a solid interest in this area of study within parts of the traditional community. However, there are many martial artists, from both the traditional and modern fraternity, that believe that such methods have never existed within karate. The traditionalists generally protest on the grounds that their sensei never taught them such methods and hence “karate grappling” is nothing more than modernist revisionism. Many modernists state that “karate grappling” is a direct response to the MMA boom and again believe that such methods never existed prior to the advent of the UFC in 1993. So what is the evidence for karate grappling? Did it ever exist before 1993 or is it truly just modern revisionism? One of the first things we need to explore is what type of grappling we are talking about when referring to “karate grappling”. In 1908 the purpose of traditional karate was clearly defined by the great Anko Itosu. In a letter to the Okinawan education authority outlining the nature of karate he wrote, “[Karate] is not intended to be used against a single opponent but instead as a way of avoiding injury by using the hands and feet should one by any chance be confronted by a villain or ruffian”. What Itosu is telling us is that the original karate was not designed for dealing with a single skilled martial artist in a ring or in the dojo, but is instead a means of keeping ourselves safe in civilian self-protection situations. This is very important and we shall return to its significance shortly. In the same letter Itosu also states, “Enter, counter, withdraw is the rule for torite.” Torite is an old term for grappling and means “seizing hands”. Itosu is therefore telling us that the karate way of dealing with civilian grappling is to get in there (enter), do some damage (counter) and then, once it is possible, flee (withdraw). As we shall see later, some of Itosu's students recorded examples of this strategy in their own works. From Itosu's outline of karate we can see that the karate of the 1900s did not concern itself with outfighting a single skilled opponent, but instead focussed on the simple and direct methods needed to ensure safety in civilian situations. We can also see that the karate of that time did address grappling in that environment. However, karate did not contain the grappling methods for dealing with a skilled “single opponent”. Therefore, those that state skilled MMA style grappling can be found in traditional kata are quite wrong. MMA grappling is of such a level to be able to deal with both a skilled “square go” and the civilian environment (when put into context and when the illegal methods are added back in). Traditional karate grappling does not address a consensual fight with a skilled opponent. This is not to say karate is in any way deficient. It simply means it was designed for a certain set of circumstances and that we need to be clear on what kind of grappling we are discussing. If you think of the direct low-level methods that most martial artists would utilise in actual self-defence – as opposed to the methods martial artists use to outsmart each other – that is the karate of the 1900s and of the kata. Having established the nature of the methods within karate, what further evidence is there that any kind of grappling existed within karate prior to the “grappling boom” of the 1990s and where did grappling fit in to old school karate? In the 1935 book “Karate-Do Kyohan” Gichin Funakoshi – another student of Itosu and the founder of Shotokan karate – wrote “In karate, hitting, thrusting, and kicking are not the only methods, throwing techniques and pressure against joints are included … all these techniques should be studied referring to basic kata”. So fifty-eight years prior to the launch of the UFC we have one of the key architects of modern karate telling us that karate includes throws and locks and that these methods are found in kata. What is key for me is that in the same section he also writes “One must always keep in mind that since the essence of karate is found in a single thrust or kick, and one should never be grasped by or grapple with an opponent, one must be careful not to be defeated through concern with throwing an opponent or applying a joint punishment hold.” This again reflects karate's civilian nature. Willingly engaging in a grapple means you are in the fight for the long haul and escape becomes much more difficult. The primary method is therefore to hit hard and fast and then flee. It's perhaps a discussion for another article, but Funakoshi is quite clear that the key to self-protection is awareness and avoidance. If that fails, Funakoshi tells that we should deceive the assailant and then pre-emptively strike and flee. This method is exactly what today's leading self-protection experts also advise. Also in accordance with today's leading self-protection experts, Funakoshi is clear that grappling is a support system and that striking must always be given priority. We must never seek grappling in the first instance. The original 1935 edition of “Karate-Do Kyohan” shows a number of locks and throws –occasionally referring to where these methods can be found in kata – using many photographs and detailed text. In the pictures accompanying this article you can see me demonstrating three of Funakoshi's throws: Kubi-Wa (Neck Ring Throw), Tani-Otoshi (Gorge-Drop Throw) and Ude-Wa (Arm-Ring Throw). Despite the fact that Funakoshi discusses and demonstrates many throws in his “master text”, there are still many modern Shotokan practitioners who deny that throwing is part of their art. Funakoshi also discusses tori-te methods in “Karate-Do Kyohan” and, in line with his teacher Anko Itosu's advice, shows numerous escapes from common civilian grappling positions, i.e. hair grabs, bear-hugs (front and back), single and double clothing grabs, seizing the neck etc. Funakoshi stresses the importance of such methods and recommends their regular practise. So far we've seen that Funakoshi, Motobu and Itosu describe grappling in karate as being simple methods that are there as a back up to the striking and to facilitate escape in self-defence situations. I'd now like to look at some other historical references to karate grappling. One of the most important books in karate is a very old one called the Bubishi. The word “Bubishi” roughly translates as, “Martial arts training manual.” As most martial artists are aware, karate is, broadly speaking, a fusion of indigenous Okinawan fighting methods and Chinese kenpo. The Bubishi deals with two kenpo styles that helped form the basis of karate (those styles being White-Crane and Monk Fist Boxing). Most of the past karate masters had a copy of this book and drew from it in their writings and teaching. The Bubishi contains an entire chapter on grappling and escapes. Although the grappling methods contained within the Bubishi are not very sophisticated, they are as effective as they are brutal. The Bubishi's twenty-ninth chapter also contains forty-eight self-defence diagrams; many of which include grappling techniques that can also be found within the traditional kata. Kenwa Mabuni – founder of Shito-Ryu and yet another student of Itosu – was one of the first to express concern that the grappling side of karate was being neglected as the art made its move from Okinawa to mainland Japan. In his 1938 book “Karate-Do Nyumon” Mabuni said that the karate begin propagated on the mainland was an incomplete version of the art and that people were wrong to think that karate was devoid of grappling. He went on to say that those who did not practise karate in its entirety were learning a hollow version of the art. Aside from the grappling in karate, it is a little known fact that Mabuni also taught Shin-den Fudo-ryu Jujutsu to his students including Chojiro Tani: the founder of Shukokai karate. So not only did Mabuni train in the grappling side of karate, he also supplemented his grappling study with methods from other arts. Another karateka to train in Jujutsu and make it part of their karate was Hironori Otsuka (founder of Wado-Ryu karate). Otsuka reached grandmaster level in Shindo Yoshin Ryu Jujutsu after many years of study under Tasusaburo Nakayama. In the two man drills of Wado we can see throws and locks, and even ground fighting techniques such as Juji-Gatame (cross lock). From the examples of Mabuni and Otsuka we can see that cross-training, far from being the blasphemy many modern “traditionalists” would have it to be, is in fact traditional! Therefore the karateka that wishes to build on the basic grappling methods of karate should not be made to feel they are abandoning the art for doing so. I see my own study of dedicated grappling arts to be following in the footsteps of many of karate's key figures. One grappling system that has a massive influence on karate is the Okinawan art of Tegumi. Some martial historians believe that karate is in fact a fusion of various styles of Chinese kenpo and Tegumi. It is has even been suggested that the name “karate” reflects this combination by using the character for “Chinese” (kara) – later substituted with the character for “empty” which is also pronounced “kara” – to reflect the influence of Chinese kenpo and the character for “hand” (te) to reflect the influence of the native grappling methods of Tegumi. Here we have Gichin Funakoshi – who is frequently regarded as “the father of modern karate” – telling us of the crude “submission grappling” bouts of his youth and recommending such training methods for the karateka. He then goes on to explain how he and his friends would engage in Tegumi bouts against multiple opponents with the aim being to avoid being seized and taken down (which is in line with the self-defence nature of karate). Funakoshi states, “I seldom had any great difficulty thrusting back a single opponent, but my difficulties increased greatly as the number of my opponents increased. Then, if I attacked one opponent, the others would find an opening in which to attack me. It is hard to think of a better way than this to learn how to defend oneself against more than one opponent, and if this sounds like nothing more than a children's game, I can assure you that those of us who engaged in it took it very seriously.” Funakoshi also describes bouts where people would attempt to hold him down as he attempted to regain his feet. 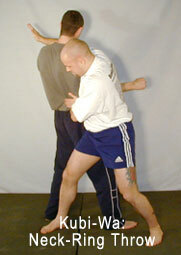 Regaining an upright position is of course the key ground fighting skill required for self-defence. For any skill to be of value it needs to be drilled live. In my dojo we use the phrase “if you have not done it live, you have not done it” to remind us of this vitally important fact. As part of our sparring we grapple to submission, practise live disengagement from grips, drill fleeing from multiple opponents (who can hold and strike) to a predetermined “safe zone”, and start from a hold down and fight to get back to our feet. Although the practicality of such training methods is hopefully beyond question, some people from within the karate community lambaste them for being “not traditional” or even “not karate”. However, the father of modern karate himself engaged in such methods and felt they represented a “unique opportunity for training” for the karateka. 2nd (from left) - Hironori Ohtsuka. 4th - Gichin Funakoshi. 5th - Choki Motobu. 6th - Kenwa Mabuni. The modernists who state that karate grappling is a direct response to the MMA boom are wrong. We have seen that karate's grappling methods did exist long before the rise of MMA. However, interest in that side of the art certainly owes a great deal to MMA; which is just one more reason why I like MMA and think the martial arts world owes it a great deal. We have also seen that karate's grappling is not in the same league as MMA grappling and therefore those who say that MMA methods were in kata all along are also wrong. The traditionalists that protest to karate grappling on the grounds that their sensei never taught them such methods need to explore their art in the depth it deserves. Most of the references quoted in this article are readily available and should be studied by all serious karateka. Whether your sensei taught you these methods or not, there is no doubt that the architects of modern karate practised grappling and regarded it as an essential part of the art. Certainly karate has generally neglected its grappling since the widespread growth of the art, but there have been many attempts to get people to reconsider this sin of omission. Surely there has never been a better time to return to the core of karate and practise the art as the holistic civilian combat system it originally was? Time will tell if we will embrace this opportunity or continue to deny what is in plain sight for anyone who cares to look. I really enjoy training in and studying the nature of original karate and it is my hope that this article will encourage others to explore this aspect of the art for themselves. It is, after all, loads of fun! Thanks for taking the time to read this article.